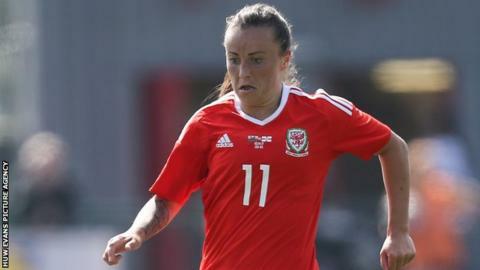 Wales remained unbeaten in their 2019 Women's World Cup qualifying campaign after a goalless draw in Group 1 against Russia in St Petersburg. The hosts had suffered a 6-0 hammering in their opening game against England but proved more resolute against Wales. Natasha Harding almost got Wales off to a perfect start but the Liverpool Ladies striker saw her shot pushed away by Tatyana Shcherbak. In the last minute, Kayleigh Green's claims for a penalty were turned down. Wales go top of their group - above England and Bosnia-Herzegovina, who both have a game in hand. Jayne Ludlow's side began their campaign with a 1-0 win against Kazakhstan in Astana on 17 September. Wales play Kazakhstan again in their next qualifier on Friday, 24 November. Wales coach Jayne Ludlow told BBC Radio Wales: "It's a hugely positive result. "They're ranked well above us and have been involved in major tournament finals over the past few years. "So for us to come out here and nearly nick it at the end with a penalty shout that wasn't given unfortunately, there were so many positives to take from the game."